The skeleton of The Great Wall of Fleet as seen from the Fleet Pond path. I call it The Great Wall of Fleet: the new decked car park being erected for SouthWest Trains at Fleet station by Network Rail. 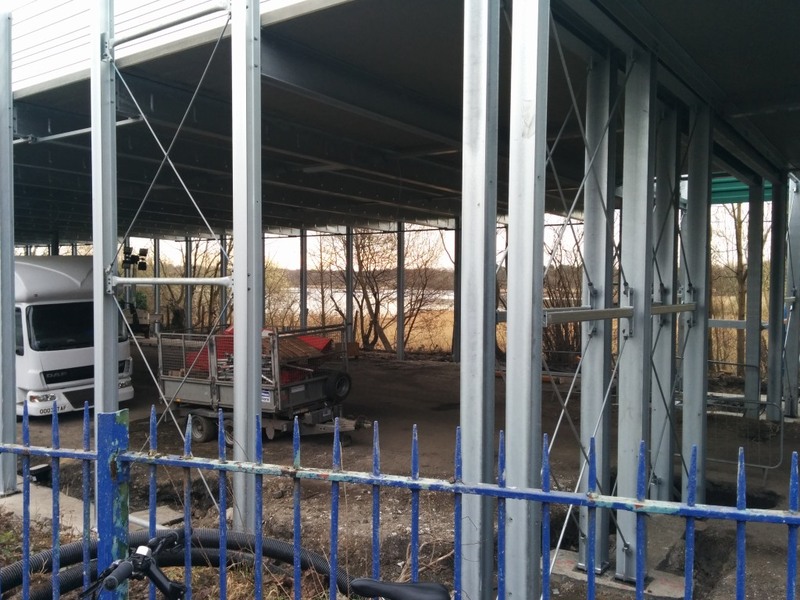 Even with just the skeleton nearing completion, it blocks the view of, and the view from, the beautiful Local Nature Reserve of Fleet Pond, which is listed as a Site of Special Scientific Interest (SSSI). The wall facing the pond is painted green – so that’s okay, then. Maybe advertising billboards will grace the platform side? From what I’ve read, it doesn’t seem like the SouthWest Trains management or Hart District Council even considered putting a decked car park on the northern side – where it wouldn’t affect the Fleet Pond. (I’ve asked SouthWest Trains in case they did). UPDATES: see below, click HERE. Before work started, reports state that there were 120 car parking spaces to the north of the railway station; and 280 on the southern side, for a total of 400 car parking spaces, give or take. The new decked car park will have 385 car parking spaces; and planning documents indicate a total of 600 spaces, including the northern car parking, after all the work is complete – A difference of 200 car parking spaces. UPDATE: National Rail reports that there were 377. Thus there will be 223 additional car parking spaces. Somewhere I read that there is to be just an additional 48 bicycle parking spaces – we’ll see. The new station and decked car park will cost us, the tax payer and train ticket purchaser, somewhere in the neighbourhood of £6.2 million (including the new station). An aritcle in Get Hampshire pegged a cost of £2.8 million for the decked car park. Quick math: 200 additional car parking spots for £2.8 million. That’s £14,000 each! UPDATE: Or £12,556 if there are 223 additional spots as per National Rail. Given the increasing numbers of people who are choosing to cycle (boosted further now that Fleet has made a start at implementing 20mph areas) then one has to wonder why such a monstrosity was deemed necessary in the first place? The station serves not just Fleet but also the neighbouring villages – places far enough away that some people may feel they are too far to cycle (in most cases a myth but you don’t know until you try). However, this new decked car park will only encourage more people who could otherwise cycle or walk to the station, say those who live in nearby Fleet, to drive instead. What a failure of vision (pun intended) from SouthWest Trains and Hart District Council who approved this monster. Tuesday: Signs erected telling people (“customers”) to remove their bicycles – but to where? 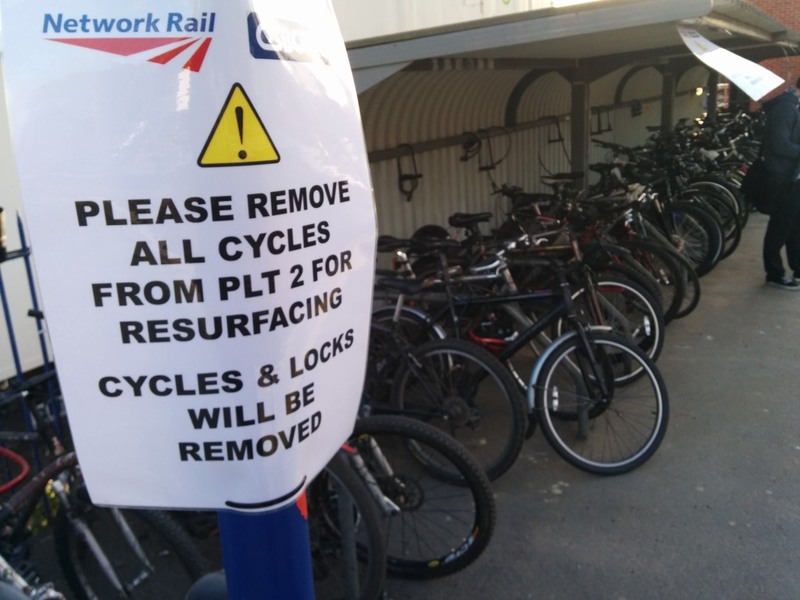 To add to this mess, this past Monday, SouthWest Trains management told hundreds of people (its “customers”) to remove their bicycles from the platform 2 cycle parking facilities. Worse, they did not provide any alternative – even temporary – parking for bicycles during the resurfacing works. Contrast that with what SouthWest Trains management provided for people that chose to drive their car to the station: 10 “premium parking” spaces. It wouldn’t surprise me if these went to their shareholders! Could it be that the SouthWest Trains management and Hart District Council, the planning authority, interpreted this narrowly, that is to refer just to car parking? It would have been at least a step in the right direction if SouthWest Trains had erected a bicycle stand or two in a couple of those “premium” car spaces – easily 10 bicycles would fit where 1 car would. That could have been 10 or more satisfied “customers” instead of just 1. SouthWest Trains management’s brazen disregard for people who cycle extends to their re-development plans of the station. The entrances to, and exits from, the parking areas on the north and south side will see little if any improvement for people who choose to cycle. It is already pretty ropy trying to exit the northern car park if you are on a bicycle. There is also a sign right there at the exit indicating that no cycling is allowed – quite where isn’t clear, but it might be on the metal bridge heading south into town beside the narrow road bridge. A person rides towards the northern car park entrance on the right. If instead you want to turn right and head north up to, oh let say, the Ancells Farm business estate or the nearby housing estates then you’ll have to either do a left onto Fleet Road and then a u-turn; or head straight over the road bridge, down the other side, go around the roundabout and cycle back up the hill to go over the bridge in the opposite direction. 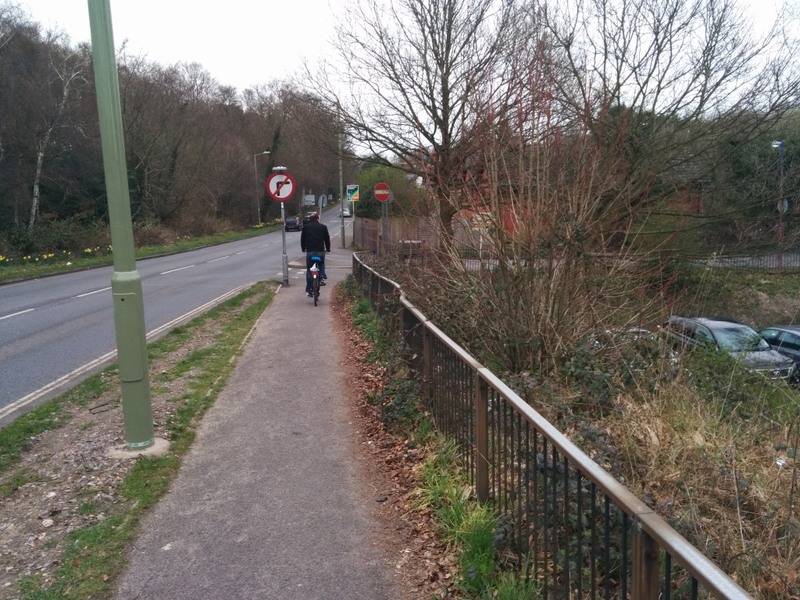 (It doesn’t help that Hampshire County Council provide no space for cycling along the narrow and busy Fleet Road – but that is a story for another day). The southern exit pits you against people driving buses, taxis and private cars; before plunking you out at a roundabout that has no facilities for cycling. This situation doesn’t look to improve with the new station design except for some London-style painting on the road – shared space for people walking and cycling! Something tells me that just won’t be good enough. The path around Fleet Pond is lovely. Now with a view of The Great Wall of Fleet. 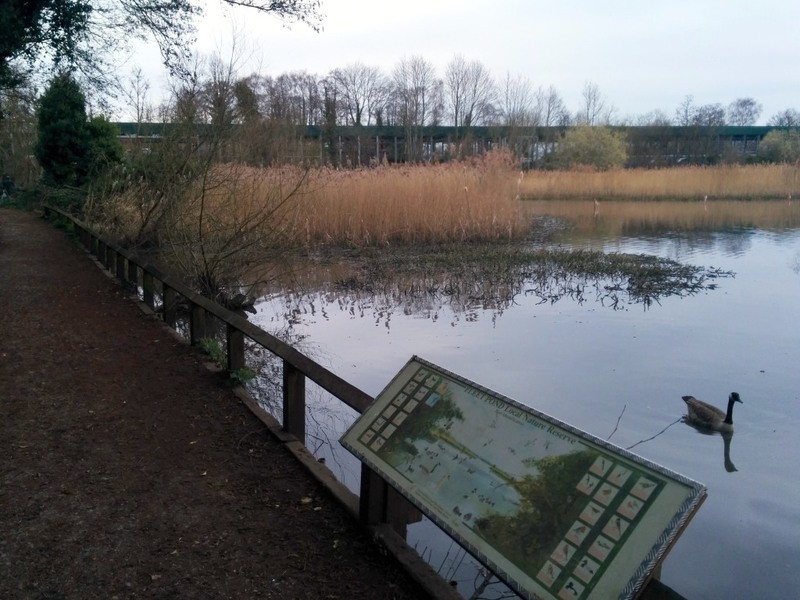 Tip: if you are heading into Fleet, then find the path running along the edge of the southern car park and the office buildings — it will take you to Fleet Pond where you can cycle leisurely towards the town centre. This is a fantastic route which has several areas set aside where you can stop to watch the wildlife (the kind riding other bicycles or the animal variety begging for food on the pond). (To their credit, Hampshire County Council have recently installed a 20mph area through a good chunk of the residential areas near the Fleet town centre – again that is a story for another, another day). What does SouthWest Trains management have to say for themselves about all this? I asked. First last July just before works got underway, and again this week as The Great Wall exerted its dominance on the landscape. “Could you tell me where I can find the plans for the redevelopment of Fleet train station? Can you tell me what will be done to improve the safety of entering and exiting the train station for people who cycling north, such as myself, towards Ancells Business Park (and return in the evening)? 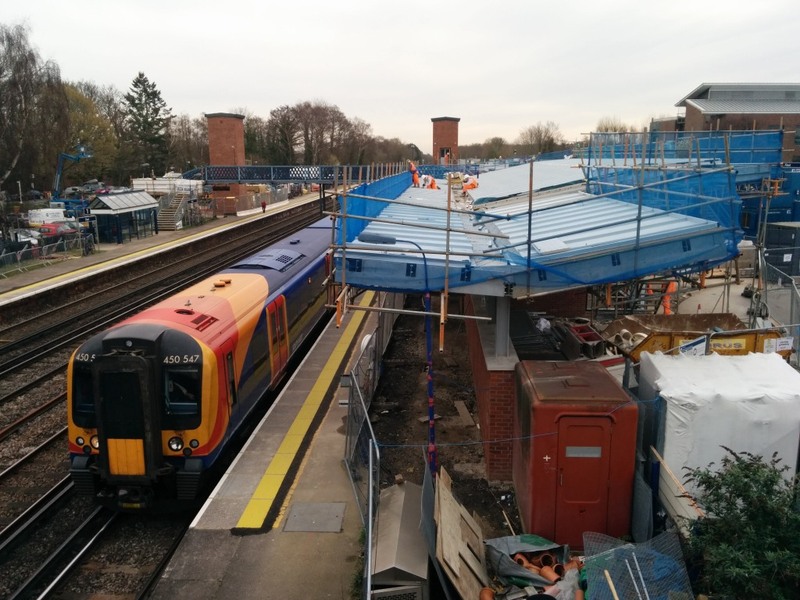 The new station is coming along, as is the new bridge – but where will there be cycle parking? “There are no development plans for the northern car park. The other car park is due to be resurfaced and have a new road lay out. Unfortunately I cannot suggest anything other than the customer exits from the other car park. So, last autumn, without final plans they say, off they went on their redevelopment, putting up a few posters (quickly out of date) here and there to inform the public of the upcoming disturbance to their commute. 11/02601/PDUND (January 2012): Erection of replacement footbridge, lift, platform waiting shelter and bike storage facilities. Is there really “no available space” to create space for cycling here? Even temporary bicycle parking would be welcome during the works. Fast forward to this week, and the works are well underway, with many things taking on their final shape. Gone is the old, tired looking station on the south side of the tracks, and in its place is a much larger brick building with an arcing roof (a temporary station was erected on the northern side of the tracks). Closed is the southern car park and in its place is the decked car park skeleton. 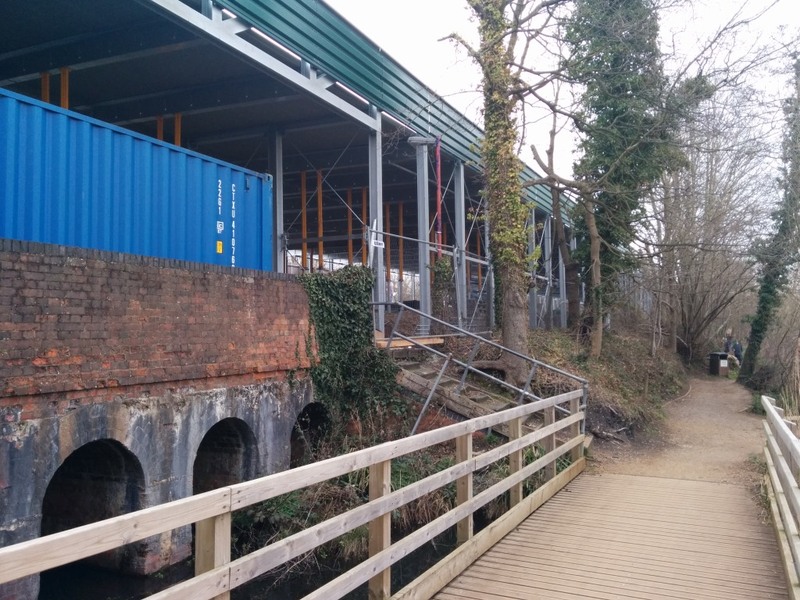 The new footbridge is coming along too with its lifts and much higher clearance, although it will be sad to see the vintage, solid metal bridge go (I wonder if they offered it to a heritage railway line? I don’t know). Just a day after the original sign went up, a fence surrounded most of the cycle parking on platform 2 – enclosing some people’s bicycles! Quite how one resurfaces a vehicle I don’t know but the intent was clear enough – they even added a yellow triangle with an exclamation point in the middle of it to! drive! the! message! home! This is to allow platform resurfacing work. There is no available space to provide temporary spaces I’m afraid. It [bicycle parking] will be restored in its current locations once resurfacing work is complete. Fleet car park has been restricted to car park season ticket holders only while we are building the decked car park. Huh? There isn’t enough space for temporary bicycle parking? Yet there is space for 10 “premium” car parking spaces? And there was space for a temporary shelter for a shop to sell coffee and newspapers? Works are expected to complete by the end of April. Now, any fencing or sign posts are used as cycle parking. Determined “customers” these are! 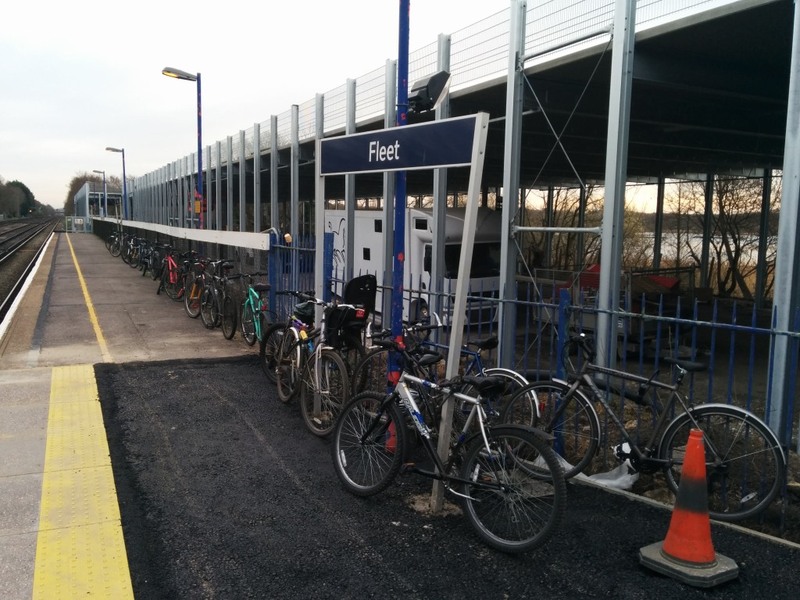 If SouthWest Trains cared about its “customers” who choose to cycle then they could have at least converted a couple of car parking spots – maybe even one of those “premium” ones! – into a spot for 10 or more bicycles each. There’s even funky bicycle stands available that are shaped like a car if that helps convince car-centric managers! Imagine: 10 satisfied “customers” parking their vehicle instead of just 1. 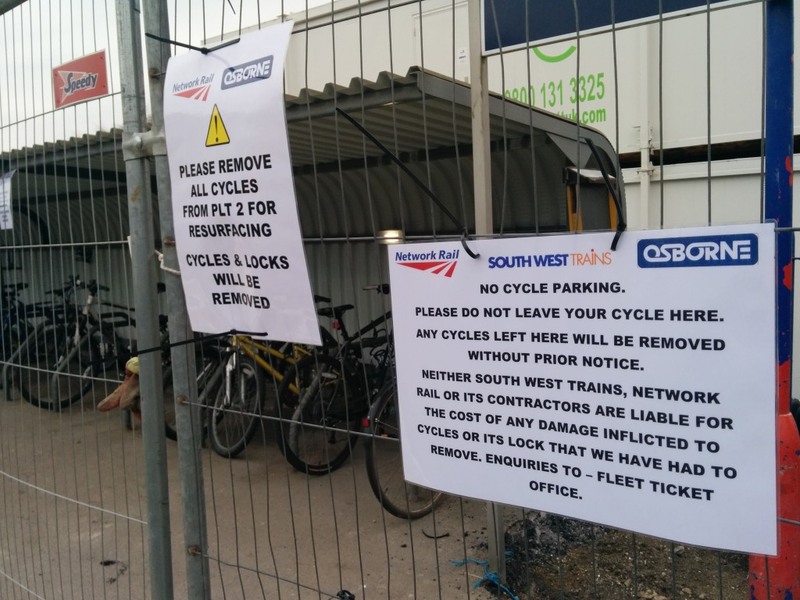 Sure, this wouldn’t come close to coping with the huge demand for cycle parking, but at least it would send the message that SouthWest Trains is a company that cares about its “customers” irrespective of their chosen vehicle. But they clearly don’t…yet. Maybe they will now? A fleeting look at Fleet Pond from SouthWest Trains Fleet station platform 2. Imagine the decked car parked filled with cars and vans. Oh! Maybe they’ll even put up billboards to completely block the view? The decked parking area, according to a report by Hart Council, is to be 261.23m long by 16.18m wide (about 4200m2); the ramp is to be 39.71m long by 7.5 wide (about 300m2) at a 12 degree angle. More pictures of the development can be found on the FLEET STEAM website. South West Trains issued this press release about the works: Spades at the ready as Fleet station improvement work starts. 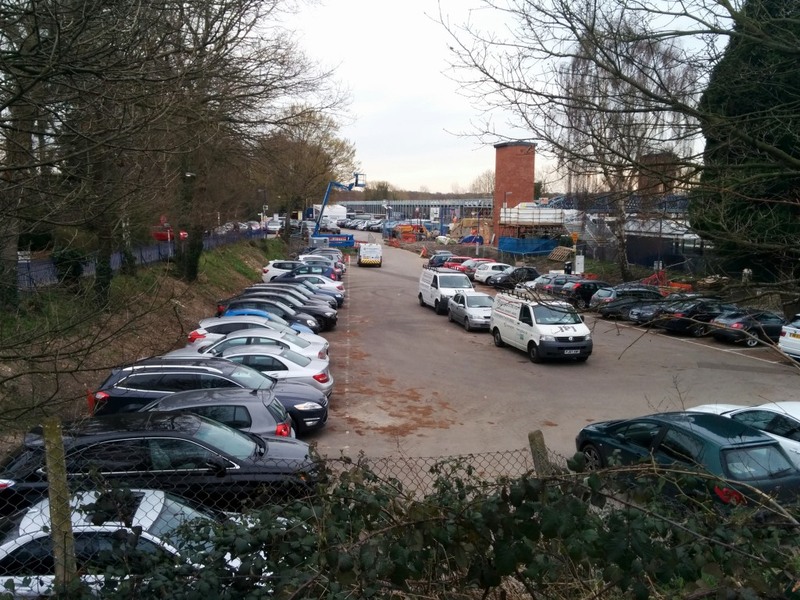 May – work appears to have come to an abrupt halt last week, around the 12th May, although the top section of the new car parking deck has been opened. A worker on site said the budget had been spent and work would not proceed until at least June. 16 May – concerns have been raised about drainage on the top deck of the new car park. It appears that rainwater would collect on the flat surface making it slippery, and what did make it to the edge would soon fall over into the path next to Fleet Pond, an site of special scientific interest (SSSI). I cycle to Fleet station every day on my way to work, and could not agree with your comments more! The whole thing has been, and still is, an appalling and hideous fiasco. Well done for your article. I dont think there is anything wrong with the car park. When I drop my car off in the morning, the views across the pond are brilliant. I’ve seen some amazing sunrises and sometimes the morning mist hangs un the air as the ducks waggle around for breakfast. It sets me off to work in a good mood. Some people have too much time on their hands. Maybe they should join me in the morning and admire the view.